I'll be on a train most of the day Wednesday - heading home from Virginia to Massachusetts. It's been a good visit and we got a lot done on getting things settled at my sister and brother-in-law's new place. Their new home is wonderful and it came with a not-so little something extra - a train set that takes up half the bonus room (or FROG - Finished Room Over Garage). 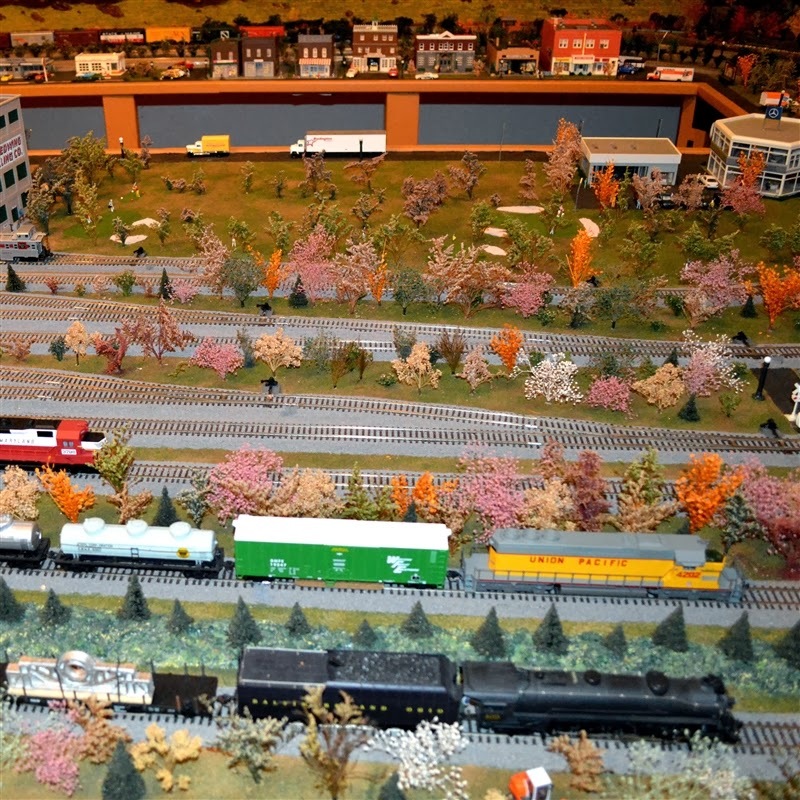 There are five different trains that circle this incredible layout. You can crawl under and stand in the open middle section to adjust the trains. There are lots of tiny scenes with streetlights and other lights in buildings to make it all look more realistic. There are so many tracks - it is very complicated to figure out how to run everything and avoid crashes! The mirror along the end wall reflects the scene making it look even larger. When you are done operating the trains it's just a short flight of stairs to get back down to join the rest of the family. My niece's children enjoy watching the trains run - and so do the adults! When I was young, our Dad ran a train set with larger cars. He usually got it out around the holidays. The tracks were on a sheet of plywood that we never got around to decorating. 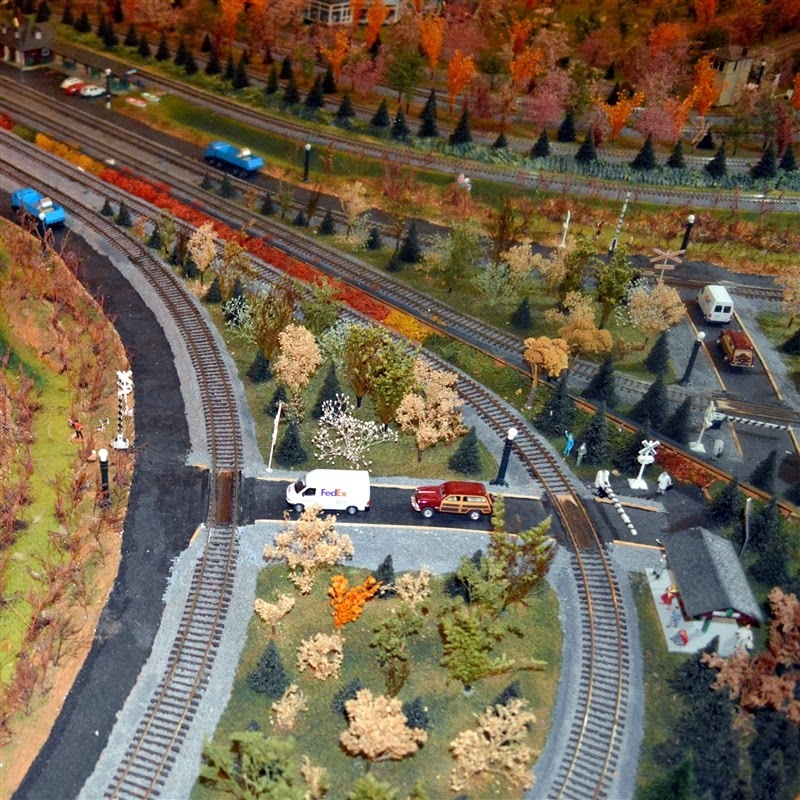 Do you have a train set or memories of a train set from your childhood? They can be pretty fascinating! It will be nice to get home and catch up with some crafty projects - we've been doing bigger projects here - painting and rearranging furniture. The new craftroom is starting to take shape but there are still lots of boxes to unpack! 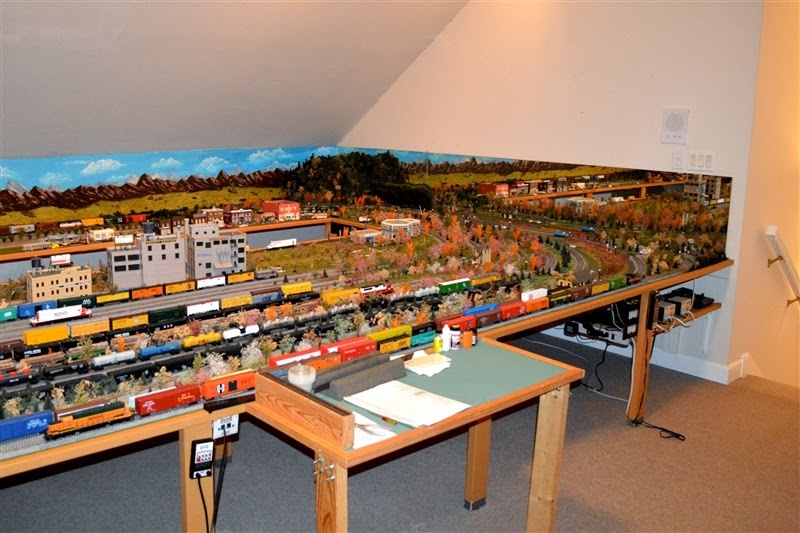 There is a train museum in Foley, Alabama with a set up similar to this. I'm glad your family "inherited" this one and hope they love it and use it. Wow! It must have hard for the previous owners to give up such a great set up. My oldest brother had a train set when we were kids. Just your basic oval track set up on the floor when he wanted to play with it & frequently not let anyone else at the controls. You know "boys & their toys". The train set up is so cool! It's so nice they inherited it and can enjoy the prior family's hobby that appears a lot of love and time went into it. It's the best when you spend a tremendous amount of time on something and can pass it on for someone else to enjoy instead of just tossing it away. I have my Dad's old train set...quite a bit larger than these. They were his as a kid. I get it out usually @ Christmas, but just put it on display. It takes a lot of room to set up to actually run. Someday when our grandson is a little older, I'll have to get it running. I'm sure he'll enjoy it. Safe travels home. We're under a blizzard warning right now...expecting to get 18 inches of snow by tomorrow. the only memory i have of trains is a set a dear friend an co-worker of mine had. he invited my husband and i to his home for a visit and dinner. he took us to his basement and showed us his train set he'd been working on, playing with and adding to. we were very impressed as the setup was similar to your brother in laws. very huge and i could have played awhile....'a long while'. what a fun dream for a small boy to grow up and continue to dream and play with! 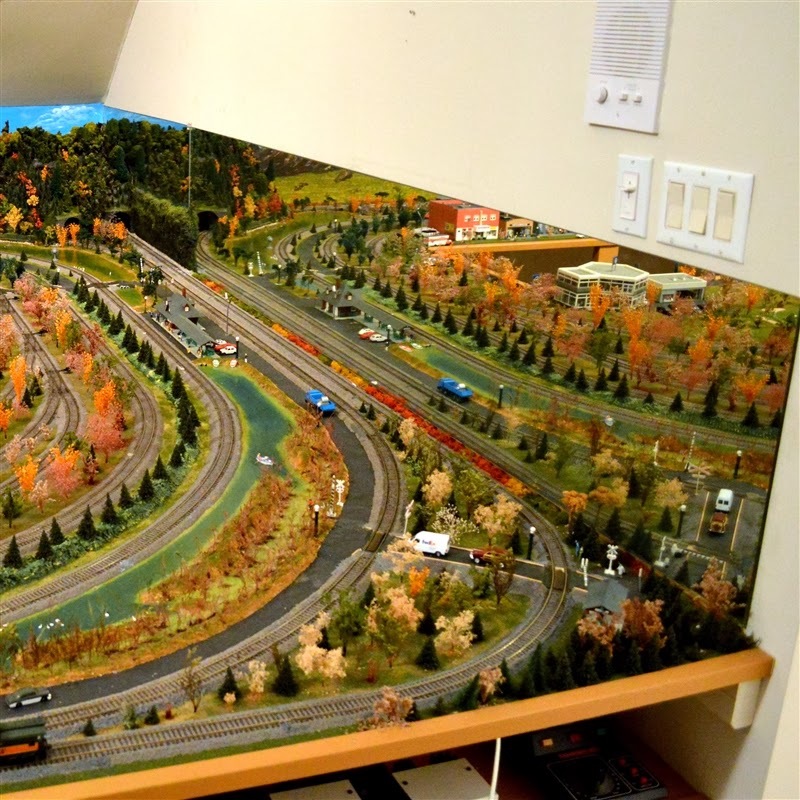 Wow - that's an amazing train setup. 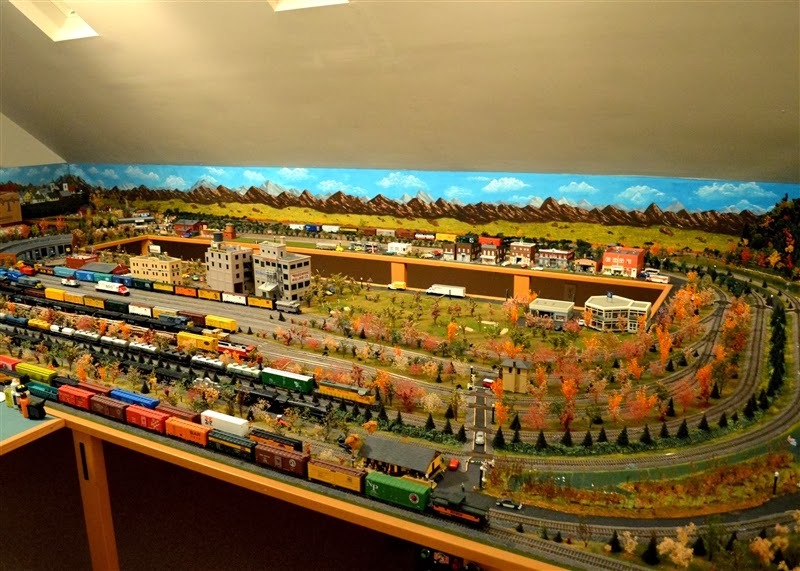 My uncle built a train yard and tracks with houses, signs, trees, depot, streets, etc. He made it so that it was part of the wall and could be flipped down (much like a Murphy bed) when they wanted to play with it. Of course, all the loose trains had to be stored separately, but it took only minutes to get them back on the track and running again. We were mesmerized by it and so jealous of my cousins who got to play with it daily! Such a neat set of trains ! My son has enjoyed his trains although his is just a small wooden set. He would certainly be in awe over these ! I hope they will enjoy it ! Wow! That's an amazing gift from the previous owner. We had trains at Christmas, too, and the platform was decorated, but not as large or fancy as that one! I'm sure that the original owners will be happy that others are enjoying their set. BethAnn M.
What a find!!! 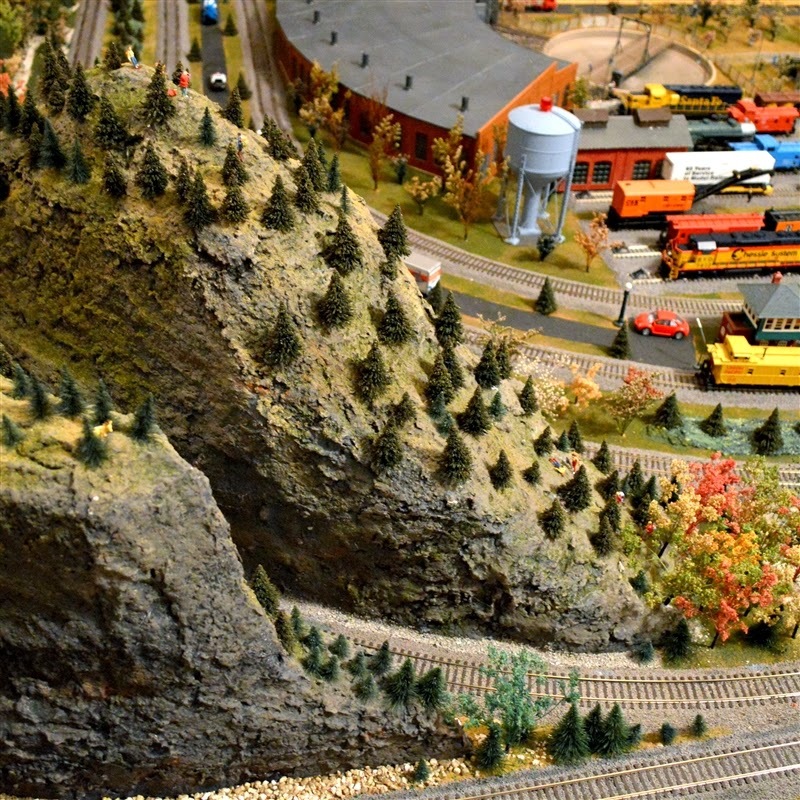 Some model trains set are VERY expensive. My oldest grandson loves trains. We have been to several train museums on our travels. We also have a train depot museum here in town and every year they have a Cookies with Santa event. I take the boys every year and make pictures. I hope to do a layout with these pics through the years showing how they have grown. The back room has a train layout much like this of your sister's and it is set up to look like our city in days gone by times. Also we have The Casey Jones museum here. His home is set up to the period in furniture and decorations. The museum next door has all sorts of railroad items for all to see. One of the old trains outside has model trains set up inside that run on the tracks. My Dad was a railroad engineer, first on steam engines and then the excitement in my town when he got to drive the first diesel engine through town. My late husband built a little play shed one time and put together a whole village of little trains. His mountains and cities looked so real and he used to play with it all the time until we moved to another house. We still have everything but it's packed in boxes. Now I have to figure out what to do with it all since he passed away last summer.